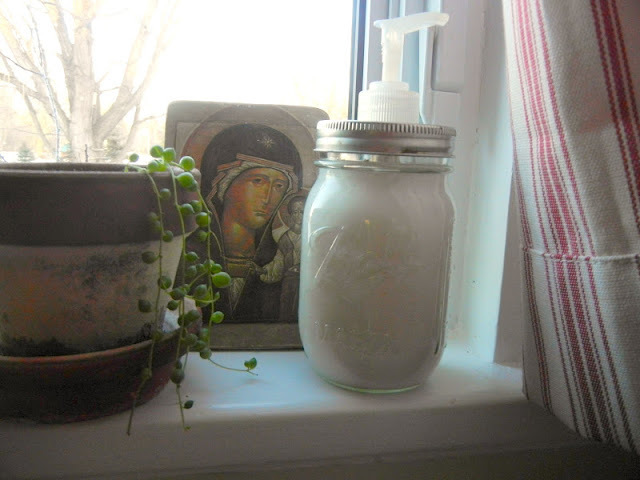 I was excited to try this idea of turning a bar of soap into a gallon of liquid hand soap when I saw it on Pinterest. For the cost of about one 6 oz. bottle of natural soap, you can make a whole gallon by just adding water, glycerin, and then simmering until thick. I've had this Trader Joe's Honey and Oatmeal soap for a while. In fact, it's the soap I use for my face because it's so gentle. I stocked up when I was there last and love that (at my last purchase) it is only $2.99 for two bars and lasts a long time!﻿ So I decided to use two of these bars (8 oz.) to turn it into liquid hand soap. I didn't grate it because it was much easier to just lightly chop with a knife. Glycerin is supposedly found in any pharmacy, according to the site, but it wasn't until the third pharmacy I tried (Wegman's) that they had it...but you have to ask because it's behind the counter. It was more expensive than I expected but you only use two tablespoons, so hopefully, it's worth it. I followed the instructions and we got a gallon of soap. It does have a bit of a snot-like consistency like the site says and you have to make sure it's not too thick so that it can work in a pump. It took much less time to cool and firm than the site said...maybe I simmered it too long. I'm disappointed that it doesn't lather up the way it does when in bar form. It actually doesn't really lather up at all and I'm kinda stumped as to why (from simmering too long?). Perhaps a different soap would work better. Hopefully, it's still getting us clean. At least it looks cute in my mason jar dispenser (which, by the way, was not a Pinterest idea)! Oh, and if anyone can tell me what to do about the powdery stuff all over the pot that's attempting to grow my rosary plant up in that picture, please let me know. I'm pretty sure that's not a good thing. Someday I will get a house plant to thrive. Someday. So happy Mardi Gras! It'll be pancakes for dinner tonight by tradition and the boys will be thrilled. 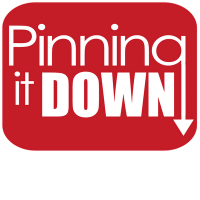 Go on and click on the link below to head over to Sarah's and see what others are pinning down! Snot-like soap, huh? It looks beautiful in your mason jar, and I'm sure it's gettin' you clean, even if it doesn't lather. I bet it smells lovely! I want to know more about the Rosary plant. Does it have another name? Where you you get one? The jar is really cute -- not sure about the soap. Ooh, you're asking the wrong person when it comes to house plants! My sister gave me a cutting of it because I thought it looked neat and she called it a Rosary plant. I saw something similar to it at a nursey once but the 'beads' were more oval shaped but I can't remember what they called it! I'll ask my sister and see if she knows! I just did a quick search and it has many names...Rosary plant, Rosary vine, String of Pearls, Chain of Hearts and it looks like there are different varieties under those names. My sister's is huge and hangs in a pot and vines down. Looks really neat and I loved the name! Supposedly easy to grow, but we shall see under my care! I'm want to know more about the rosary plant as well. ;-) I need to try that gallon of soap trick. I have been looking at a lot of the "make your own cleaners" pins. Yours looks really cute. :) Hopefully it will do the job. The biggest thing that I would like to solve is how to have pump hand soap (I just prefer the pumps) but not all the waste- empty pump bottles and refill bottles. This seems like it would be a good solution.